Renaissance Healthcare and Rehabilitation Center in West Philadelphia rearranged the elderly woman’s belongings before she returned from the hospital. The staff wanted to tidy up her room, but that left the woman disoriented. She peered into her life and saw nothing. Her family and friends all passed away. Now she couldn’t even find her personal things. The now Rev. Mr. Addisalem Mekonnen approached the woman, her bed facing the window. He brought her a crucifix. She placed it at the bottom of a drawer. The walls of the room remained bare. The elderly woman held onto his every word. “She was completely distracted from all negative feelings,” said Shirley Crosby-Cole, a friend of Deacon Mekonnen and present at the time. Crosby-Cole and Mekonnen, then just a newbie to St. Charles Borromeo Seminary, returned to the nursing home to visit the woman. The walls, then full of brightly colored pictures the woman painted, mirrored a change inside her. 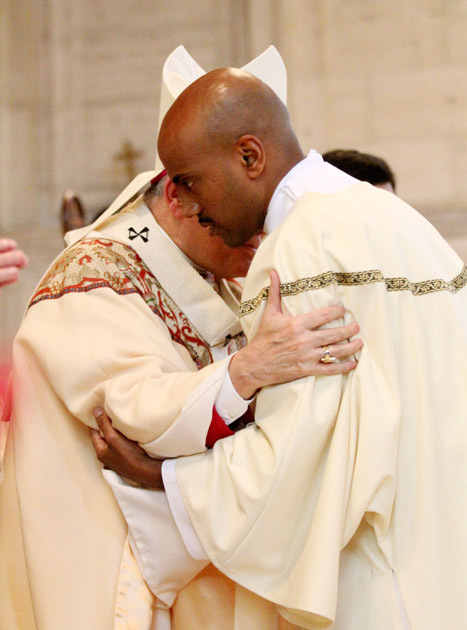 Crosby-Cole knew then, understood more than anything in that moment, that Mekonnen was destined for the priesthood. He thought about it once in seventh grade when a seminarian spoke of his vocation and its joy. For a moment, he thought of the priesthood, but it didn’t stick. Naturally he wanted a wife and children when he grew up. Attending Catholic school from second grade onward at St. Francis de Sales on 47th Street in West Philadelphia, Mekonnen’s family belonged to the Ethiopian Orthodox faith, celebrating the seven sacraments though not in union with Rome. His mother walked him and his brothers from their home to Catholic Mass each Sunday at St. Francis de Sales because no Ethiopian Orthodox church existed in the area. Mekonnen loved the Mass, attending on his own when his mother worked Sundays. He didn’t memorize formal prayers, not even the Hail Mary. He informally talked to God from his heart and read Scripture. His faith grew in third grade when he and his classmates placed money in a globe to provide milk and necessities to poor kids his age in other countries. He lent a hand to Sister Mary Carmella Greco, I.H.M., at St. Francis de Sales, helping her clean and decorate the church and plant flowers. He even went shopping for her when she had knee surgery. “Keep your head up and always look people in the eye when they’re speaking to you,” Sister Mary Carmella once told Mekonnen, and he learned to do so. He found a man, an orthodox monk priest, who spiritually directed him, but when politics forced the monk out of the Orthodox church, Mekonnen felt a void. In the lapse left by the absence, Mekonnen looked for a way to get back with God and found a book and spiritual practice called “True Devotion to Mary” after looking it up on Google. He mostly attended Orthodox church liturgies, which had a language barrier, but he felt God’s presence there. He also went to St. Francis de Sales on occasion. He practiced the devotion’s 33 days and consecrated himself to Jesus through Mary in 2005. On Dec. 12, the feast of Our Lady of Guadalupe, Mekonnen made his consecration. Through that, he realized God asked him to become Catholic. So he entered the church and then began to hear the call to the priesthood. He couldn’t understand why God called him. He found consolation and confidence in knowing Mary would help him answer the call and spread the “True Devotion.” That consolation and confidence in Mary motivated him and encouraged him as he entered the seminary in 2007. 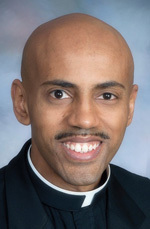 It will culminate this Saturday when he is ordained a priest, and on Sunday, May 17 at 3 p.m. when he celebrates his first Mass at St. Francis de Sales Church.